To ensure the natural integrity of the caverns and animal habitats, only two tours per day will be given. 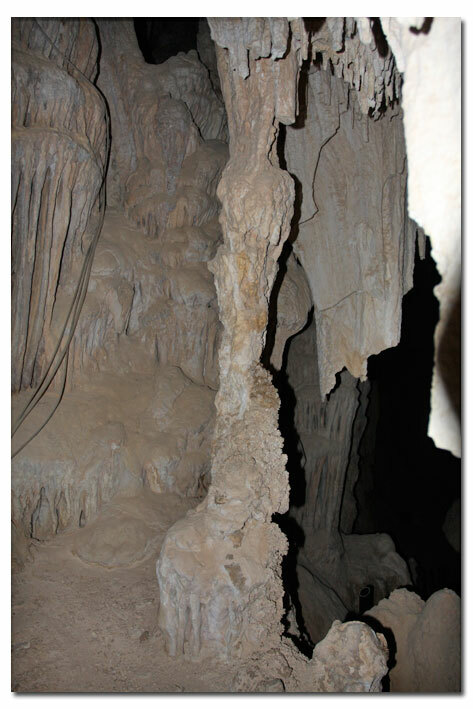 Tour Details: The tour involves a 1.5 mile moderate roundtrip hike to/from Mitchell Caverns and an hour guided tour of the cave. Payment options: Credit card or cash. Note: Because of the remoteness of the park, please have exact change. 11 a.m. and 2 p.m. Fridays through Sundays (including holiday Mondays). Park is closed Christmas Day and New Year's Day. Reservations: Required. Reservations will be taken by phone only on Mondays between 8 a.m. and 5 p.m., beginning October 30, 2017. We accept up to 15 people per tour. You must speak with a staff member to make a reservation at (760) 928-2586. Phone messages and emails will not be accepted. For school and group tours, please call during reservation hours for more information. Do not expect to get a spot on a cave tour without a reservation. Space is limited and tours fill up very quickly. Make sure to arrive early. Give yourself plenty of time to journey to the park as road conditions are primitive and subject to delays. Reservation holders must arrive and pay for their tours at least 15 minutes before they are scheduled to depart. For Video Tour of Mitchell Caverns click here. An account of Jack Mitchell's first descent into the "Winding Stair Cave" during the period of his early explorations would read like fiction. It was a chilling experience as he lowered himself into the unknown depths with the use of a "bosun's chair" that constantly turned in the darkness, causing him to virtually lose all sense of both time and direction. His signature on the cavern wall, dated July 1, 1931, indicates that he had penetrated this cave at least as far as the portion he called "Dog Leg Room. " The Cave of the Winding Stair has been utilized as a training area for cave rescue teams under a program sponsored jointly by the California Department of Parks and Recreation, the County Sheriff's Department, and the National Park Service. In conducting the tours that Jack guided through the El Pakiva and Tecopa caverns, it was necessary to make a separate entrance into each cave. This was a situation that always bothered him, because he said that it "spoiled the tour." He told everyone that he had always wanted to connect the two caverns with a tunnel that would provide a continuous excursion, but lack of financing prevented him from making this improvement. It was finally accomplished after his death, when the California Department of Parks and Recreation hired crews to do the work. With the added publicity that the State was able to provide, the annual count of visitors to the Caverns has increased dramatically since the Mitchell years. Keeper of the Caves - Mitchell Caverns originally titled Jack Mitchell Caveman, this expanded second edition (2003) features many new photographs, restores the missing chapter on famous botanist Mary Beal and includes a foreword by renowned Mojave Desert historian, Dennis Casebier. 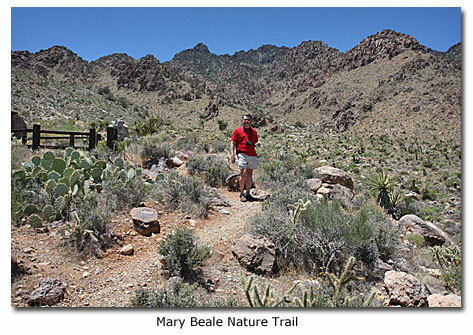 The Mary Beale Nature Trail, located near the park's visitor center, is a self-guided moderate walk through the desert. A brochure describing desert plants and animals is available. Another, more strenuous, mile-long trail leads to a spring above the visitor center. 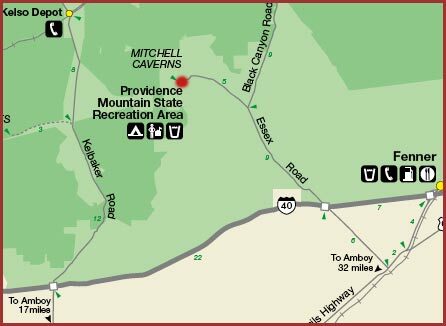 There are also cross-country hikes to the many peaks in the 5,900 acre Providence Mountain State Recreation Area. Mitchell Caverns, located in the heart of the Providence Mountains State Recreation Area, is a popular tourist attraction. Spectacular and intricate limestone formations found include stalagmites, stalactites, helictites, lily pads, draperies, curtains and popcorn. 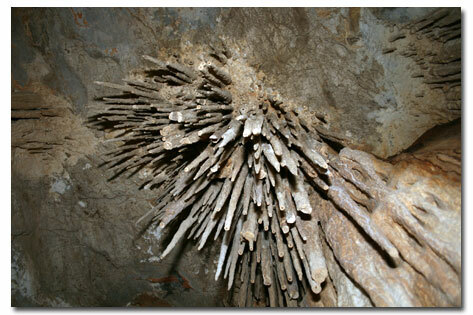 First opened for tours by Jack Mitchell in 1932, the caverns were purchased by the State in 1954. They are the only limestone caverns in the State Park System. Located at an elevation of 4,300 ft., temperatures usually remain moderate throughout the year. The most popular months to visit are October through May. Temperatures inside the caverns are a constant, comfortable 65 degrees. Location/Directions: The recreation area is located in the eastern Mojave Desert, 56 miles from Needles on Interstate 40, 116 miles east of Barstow, and 16 miles northwest of I-40 near Essex Road. Located at an elevation of 4,300 feet, the park is surrounded by one of the newest National Parks, Mojave National Preserve. Other locations to visit in Mojave Desert.